Explanation: Historically active, this year's Leonid meteor shower was diminished by bright moonlight. Still, faithful night sky watchers did see the shower peak on November 18 and even the glare of moonlight didn't come close to masking this brilliant fireball meteor. The colorful meteor trail and final flare was captured early that morning in western skies over the Canary Island Observatorio del Teide on Tenerife. Particles of dust swept up when planet Earth passes near the orbit of periodic comet Tempel-Tuttle, Leonid meteors typically enter the atmosphere at nearly 70 kilometers per second. Looking away from the Moon, the wide angle camera lens also recorded bright stars in the familiar constellations Orion and Taurus near picture center. 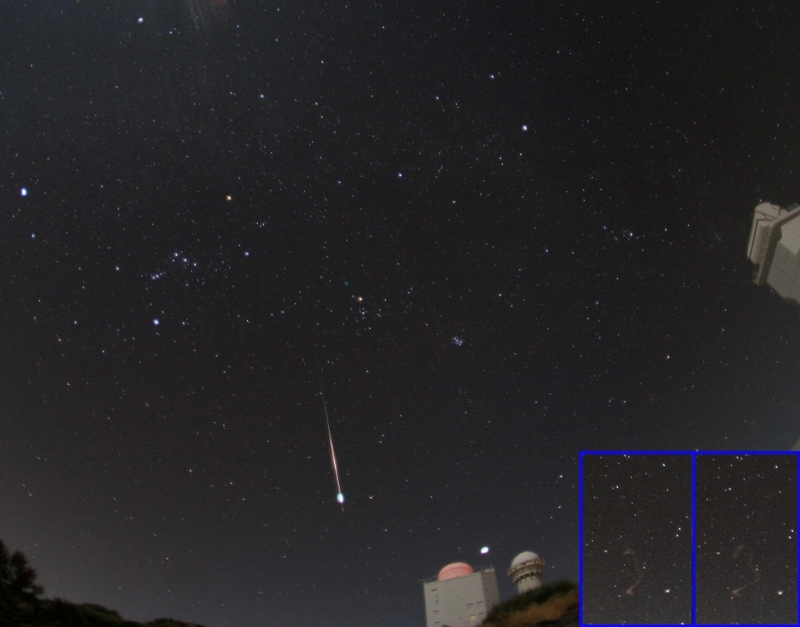 Inset are two exposures of this fireball's persistent train. The consecutive train images follow the meteor's flash by several minutes as high altitude winds disperse the faint, smokey trail. The two large telescope buildings are the GREGOR telescope with reddish dome and the Vacuum Tower Telescope along the right edge of the frame, both sun watching telescopes.